Moff® PAC-MAN Has Arrived for the Wearable Era! Simply slap the Moff Band on your wrist and move your arm up, down, left, and right to control PAC-MAN as you eat up all the cookies and avoid the ghosts. Plus, Moff PAC-MAN encourages you to get into the game by moving your body as you get some exercise! Even better, this game is a free download in your favorite app store. Instead of just moving your finger to play the game like in the Classic PAC-MAN, Moff PAC-MAN encourages you to use your mind and body while playing. Moff PAC-MAN is great for all ages – particularly, adults and active seniors who want to move around with your kids and grandkids! Moff is targeting to make the world healthier through gamified fitness apps. Join us in ”Moff-icizing” content! 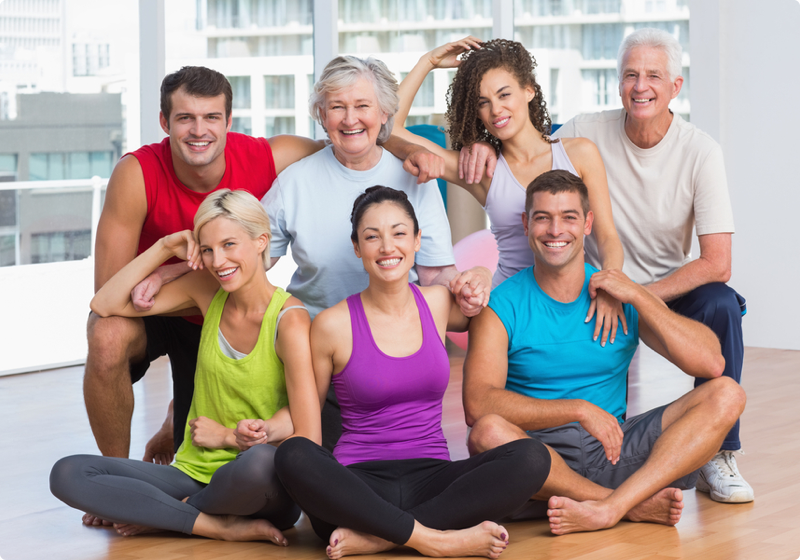 Moff is seeking content and business partners interested in developing apps to encourage children, adults and active seniors to be more active using the Moff Band. We provide an easy-to-use content creation tool to create “Moff-icized” apps that can quickly turn your existing content or service into an gamified fitness app. Moff is also welcoming any business developers interested in utilizing the Moff PAC-MAN concept within their business. For more information, please contact us from below. To play Moff PAC-MAN, you will need the free Moff PAC-MAN app and the Moff Band. Moff Bands are available for purchase on Amazon. Get out your Moff Band and download the Moff PAC-MAN app. Follow the in-app instructions to sync the Moff Band to the app. 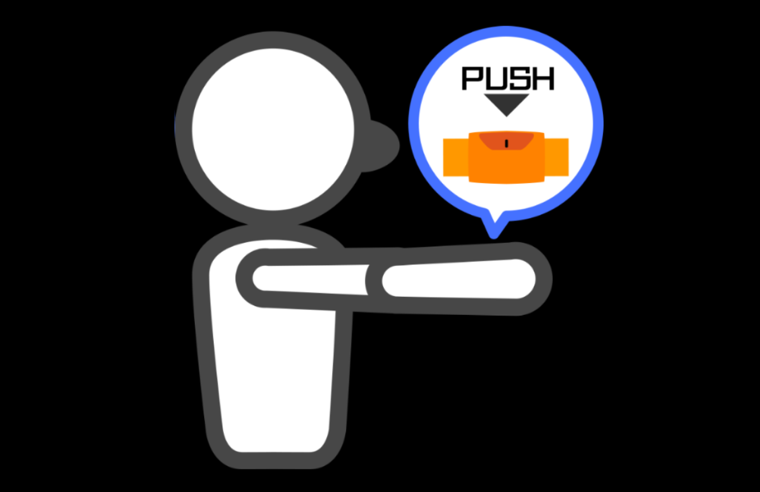 After setting up your Moff Band, you are encouraged to practice using your arm to control PAC-MAN. Controlling is very easy! If you want to move PAC-MAN up, raise your arm with Moff Band up, and do the same with down, left and right. Finally, you are ready to play the game! Choose between the Score Attack and Time Attack game modes to start the game. Compete with your friends and see who can get the highest score! 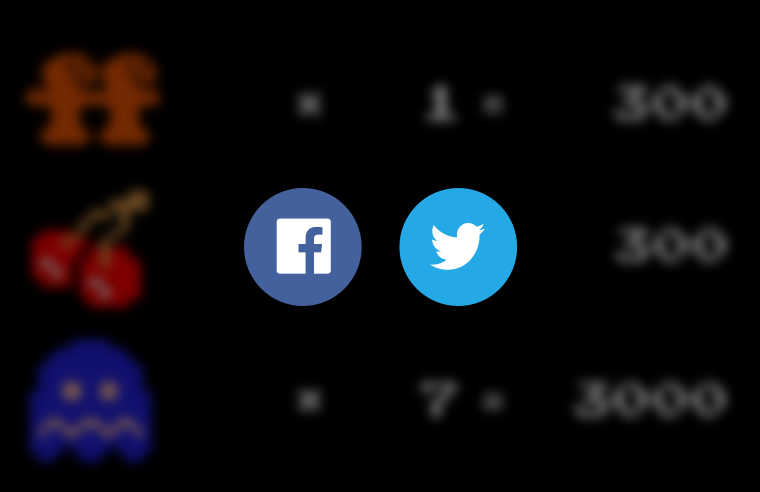 Share your score with your friends on Facebook, Twitter and Instagram! Move your arm up, down, left, or right as you direct PAC-MAN through the map. PAC-MAN is trying to avoid the ghosts while eating all of the power cookies on the screen. When PAC-MAN eats the big power cookie, the ghosts become blue for a limited time and then PAC-MAN can eat the ghosts. Aim for a high score by eating as many power cookies, ghosts, cherries and ff's as you can! 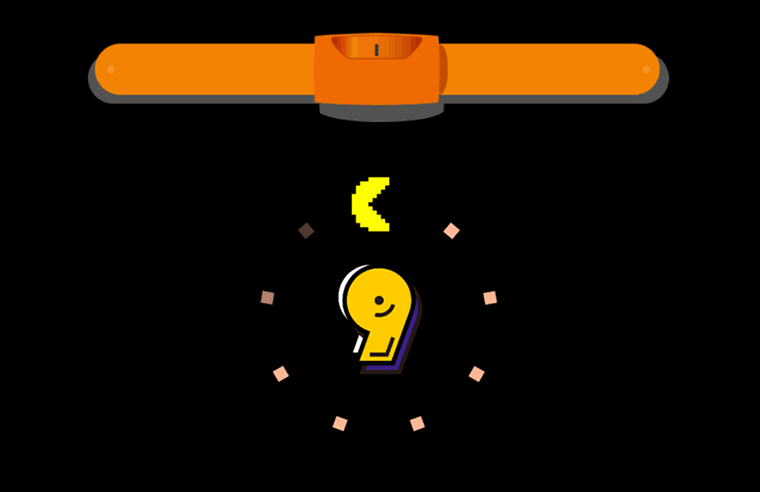 PAC-MAN's speed depends on the angle from the center point. If you swing your arm all the way from the center, it will go fast, and if you move your arm just slightly from the center, it will go slow. Try to get a high score within the limited time! Eat all the power cookies as fast as you can! What are the compatible devices for Moff PAC-MAN? 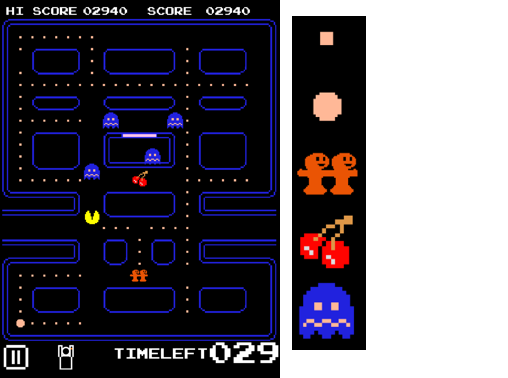 Click here for a list of compatible devices for Moff PAC-MAN. What do I need in order to play Moff PAC-MAN? You will need a smart device, the Moff PAC-MAN app, and a Moff Band in order to play Moff PAC-MAN. 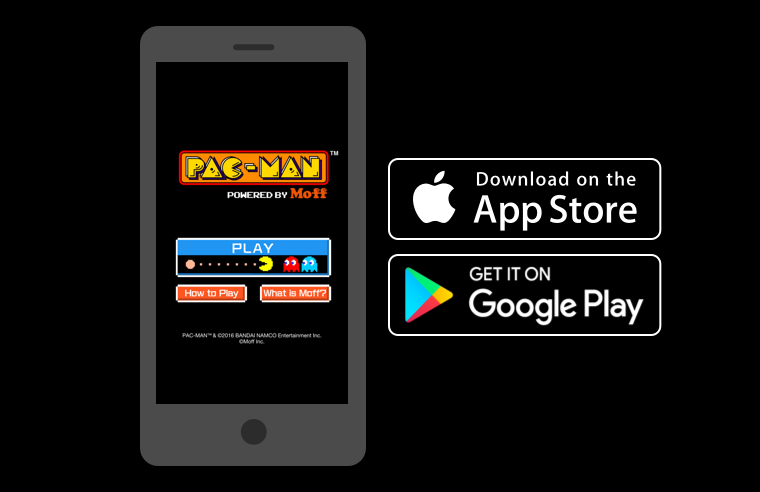 You can download Moff PAC-MAN app from Google Play Store, or from iTunes Store. You can purchase a Moff Band from Amazon. I cannot sync my Moff Band with the Moff PAC-MAN app on my smart device. What should I do? Please try the following if you cannot sync the app and the device. Press the power button and make sure Moff Band’s power is on. The light should turn green then disappear after a few seconds. Under your phone’s settings, make sure your smartphone or tablet’s Bluetooth is ON. Check if your device is under compatible device of Moff PAC-MAN. Make sure there are not too many Bluetooth devices around the area you are playing Moff PAC-MAN. Sometimes, when there are too many Bluetooth devices, the app and the Moff Band are harder to connect. If you are still having trouble syncing the app and the Moff Band after trying all of the above, no worry, we are here to help you! Please contact us. support @ moff.mobi. I pressed the power button but green light does not turn on. When the green light doesn't turn on, try replacing the battery (type CR2032) on the back of the Moff Band. Here's a video of how to replace the battery. Why doesn’t PAC-MAN move exactly the way that I move my arm with the Moff Band? The app may not have calibrated correctly with your Moff Band. Please go back to the title screen and place your Moff Band on a flat surface in front of the smartphone or tablet device with which you are trying to connect. Now, try re-syncing the app with the Moff Band. After you re-sync the Moff Band, you may want to try “Practice” on Mode Select Screen to see if everything is calibrated correctly this time. Can I play Moff PAC-MAN without a Moff Band? No, Moff PAC-MAN was created to encourage the user to move their body and play PAC-MAN. So, the Moff Band is necessary to play the game. You can purchase a Moff Band at Amazon. Are there going to be any level updates to the Moff PAC-MAN app? At this point, we do not plan on updating the app with more levels. Are there any other apps I can play with Moff Band? Yes! 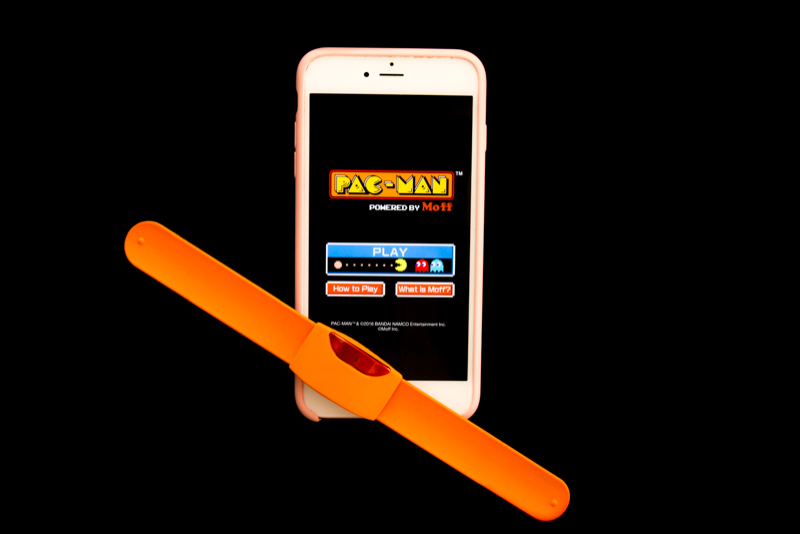 As of September 2016, there are two additional apps you can play with Moff Band. Our original app is Moff(iOS), Moff(Android). 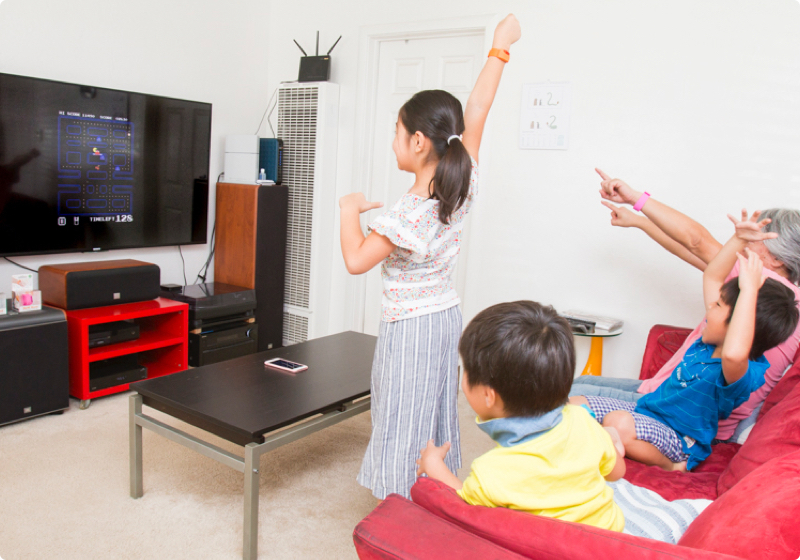 With Moff Sounds, move your arm as you quickly become a guitarist, tennis player, or even a wizard! Another Moff Band-compatible app is PBS Kids Party(iOS), PBS Kids Party(Android). With PBS Kids Party, you can do freeze dance, swing to find party piñatas, or count down to blast off a rocket! 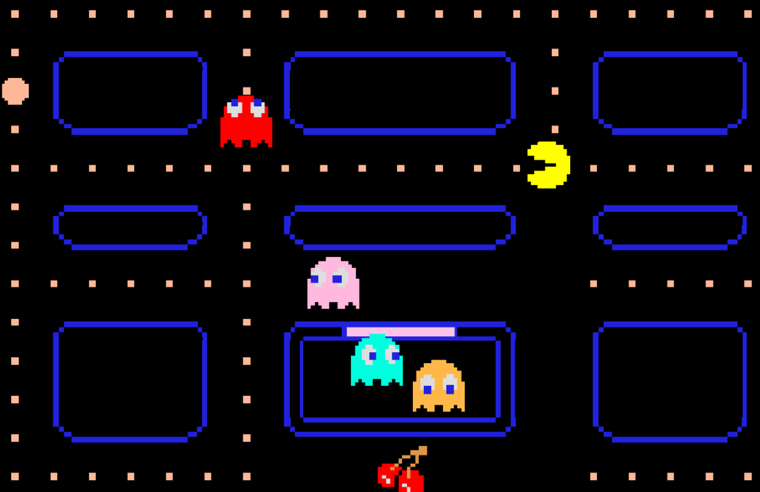 How can I learn more about Moff PAC-MAN’s game rules? 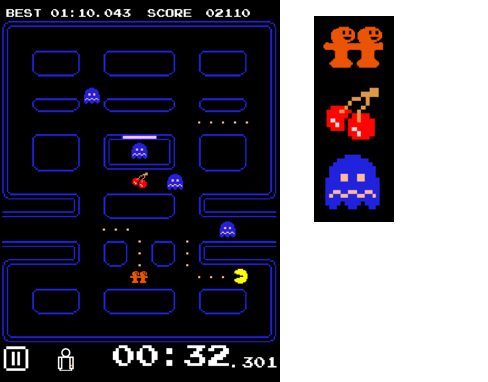 You can check the game rules of Moff PAC-MAN here. Can I collaborate with Moff to make my existing content or game more physical and fun with a Moff Band? Yes! Moff is looking for partners who want to create healthy, energetic, and fun games using their own branded content! Please contact us from the Moff B2B partnership page to discuss any opportunities for partnership. Copyright © 2016 Moff Inc. / PAC-MAN™ & ©2016 BANDAI NAMCO Entertainment Inc.
Moff and the Moff logo are registered trademarks of Moff Inc.